Parkway Curvilinear by Brown Jordanpatio furniture sets provides a modular seating option to coordinate with the popular Parkway Sling and Cushion collection. 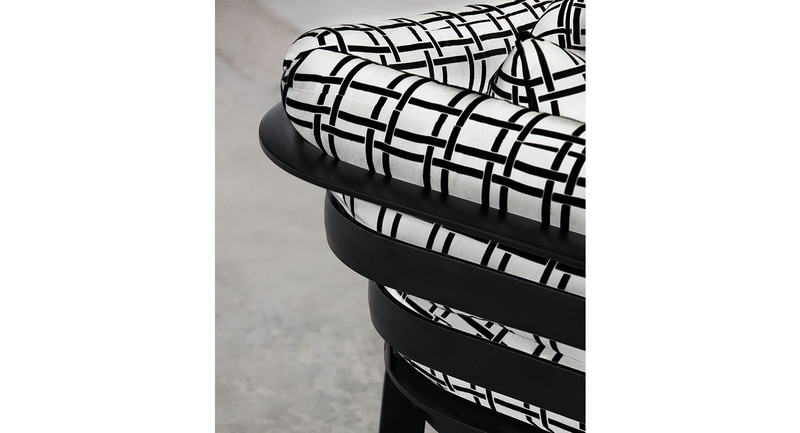 A right or left arm facing loveseat, an armless chair, a 60-degree ottoman, and a 90-degree module can be positioned to form a circle or a variety of sinuous shapes. Cushions are finished with an exclusive rod insert that eliminates the need for snap tabs, resulting in a clean, refined appearance. Plush, tailored cushions completes the outdoor patio look. 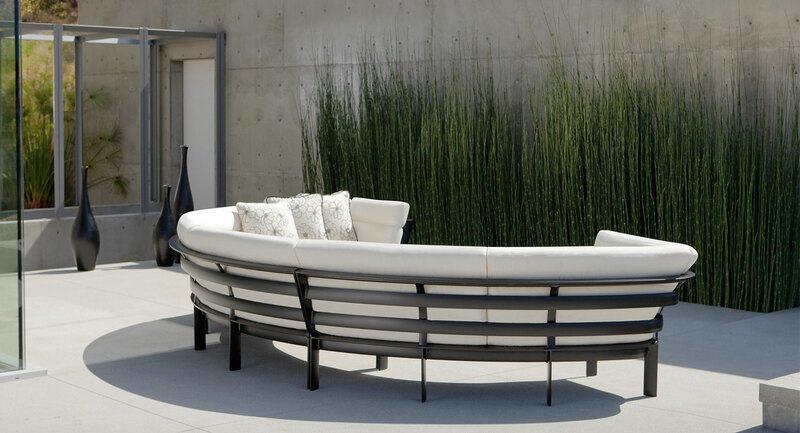 A model of easy elegance, the Parkway Curvilinear collection features a mix of versatile modular patio furniture pieces in simple, sensuous shapes that combine in countless ways to fit the size and the function of the setting, as well as the nature of the occasion. Parkway Curvilinear by Brown Jordan allows you to compose exactly the inviting, livable space that you envision. 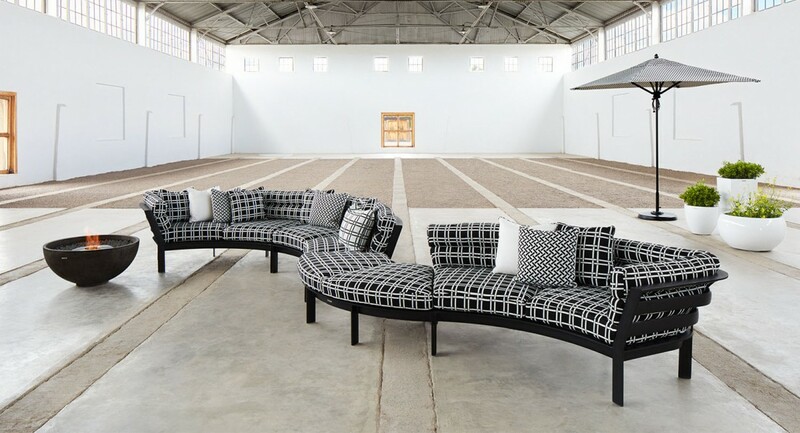 Designed by John Caldwell, Parkway Curvilinear offers modular seating to coordinate with the Parkway Cushion collection. The Left, Right and Center Modules combine with 60- and 90-degree Ottomans to form a variety of fluid forms. Tailored cushions, designed with a rod insert that eliminates the need for snap tabs, create a clean, refined appearance suited to elegant contemporary settings. Available in all finishes. Available with Suncloth® cushions and COM pillow. Parkway Curvilinear collection includes left and right arm facing loveseat sectionals, armless loveseat sectional, 60-degree ottoman and 90-degree ottoman. Features a powder-coated cast and extruded aluminum framework that is fitted with Suncloth® cushions. Powder-coated technique insures a uniform coating and a long-life finish. Suncloth® is a solution-dyed acrylic fabric with high quality pigments that result in enduring color. Suncloth® cushions are designed to withstand the environment; its yarns are woven into fabric that resists stains, mold and mildew making it ideal for indoor and outdoor use. All fabrics are exclusively Sunbrella®. 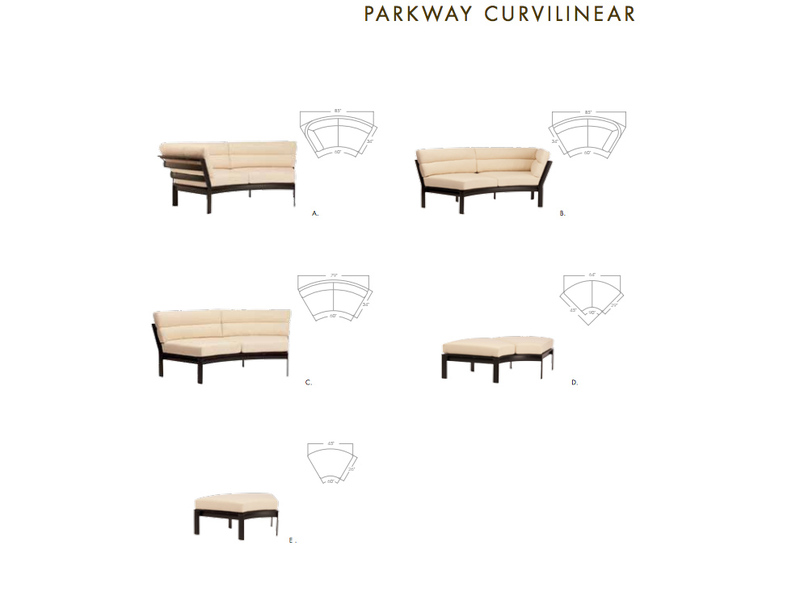 Parkway Curvilinear is suitable for all outdoor and casual living spaces in residential and hospitality environments. Parkway Curvilinear independent sectionals enable a multitude of seating arrangements and provide a clever solution to meet a variety of social and space needs. Joining devices are included with each sectional unit. Parkway Curvilinear ottoman can double as the lower half of a chaise when used with the any of the sectional seating pieces. 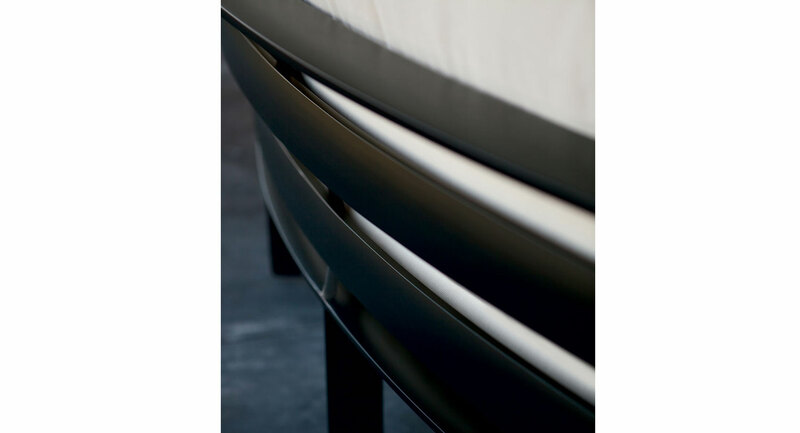 Parkway Curvilinear back cushions are finished with an exclusive rod-insert element that eliminates the need for snap tabs resulting in a clean, refined look. Parkway Curvilinear cushions can be altered to accept welting. Parkway Curvilinear cushions are built with concealed rear zippers for easy cleaning and replacement. Parkway Modular seating pieces are compatible with Parkway and Parkway Modular tables. 27 custom frame finishes and 134 Suncloth® fabrics allow for versatility when designing for indoors and out. 15 years Residential Limited Warranty for cast and extruded aluminum frames and 5 years limited for fabric on cushions. Brown Jordan aluminum collections undergo a rigorous finishing treatment that results in world-class, enduring furniture for outdoors or in. Hand-made frames are prepared for painting via a meticulous process in which welded joints are ground to achieve a uniform dimension. Far surpassing industry standards, each frame is then hand-sanded, buffed and polished to achieve a smooth surface, allowing for superior adhesion of the final powder coat process. Each frame is washed to remove remaining particles from the grind and buff process. The bath is followed by a clean water rinse. After rinsing, the frame is treated with Chroma-coat solution that acts as a sealant and bonding agent for the final powder coat finish. After the Chromo-Coat bath, the frame is rinsed again in cold water and heat dried. The Hybrid primer base coat sealant is an epoxy/polyester blend that prepares the frame to receive its finish coat. This blended bonding agent is specially formulated to adhere to aluminum. The epoxy grabs the metal and the polyester simultaneously grabs the top powder coat. The outcome is an advanced, integrated bond resulting in premium paint separation resistance while allowing for exceptional color and gloss retention. The primer coat alone, even before application of the final Ultra Fuse™ powder coat, achieves superior UV and salt spray resistance, providing for significant barrier against corrosion, far exceeding industry standards. The Ultra Fuse™ powder coat final finish is applied with an electrostatic technique that creates a complete and uniform coating on the bends, curves and corners of each frame. The result is an attractive, durable, high-quality finish that will not flake, peel or blister and will be enjoyed for generations. For additional care and cleaning instructions, please contact us. Learn more about Brown Jordan Lines in Miami and South Florida by contacting and or visiting our showroom to experience Brown Jordan and our other outdoor furniture lines in Coral Gables, Miami.